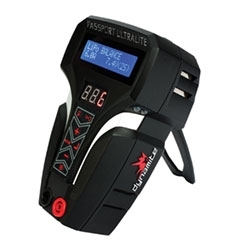 The Dynamite® Passport™ UltraLITE 50W AC/DC handheld charger is far more than just your standard 50W AC/DC charger. Yes, it can charge and balance 1–6S Li-Po, Li-Fe and Li-Ion, as well as Ni-MH, Ni-Cd and Pb batteries — but that's just the beginning. The charger is a one-of-a-kind RC multi-tool that can be compared to a Swiss Army knife when it comes to utility. The UltraLITE charger boasts four high-intensity LED lights to illuminate your workbench or pit area and a 1A USB charge port that can be used to charge an iPhone®/iPod® or any other USB charge-compatible device. Its unique case design makes it easy to hold in one hand while manipulating charge settings, and the preinstalled "kickstand" allows the charger to be positioned vertically or hung at the owner's discretion. Additionally, the charger has a built-in independent Li-Po/Li-Fe/Li-Ion battery voltage checker and discharger that allows users to check individual cell voltages to verify pack balance while charging another battery pack or when the charger is turned off. All of these features are easily monitored thanks to their own three-digit LED display.